Paddle boarding is an incredibly fast growing sport that has infinite ways to personalize and extend your paddle experience. Once you have your paddle board it may be time to start looking to accessorize your board for even more usage. Customizing your pride and joy with some of the best sup accessories will expand the realm of your adventures. We all paddle board a little differently so finding your perfect gear will make your trip all the more pleasurable. This is a lightweight over the shoulder strap system that makes it so you can transport your rigid SUP easily. 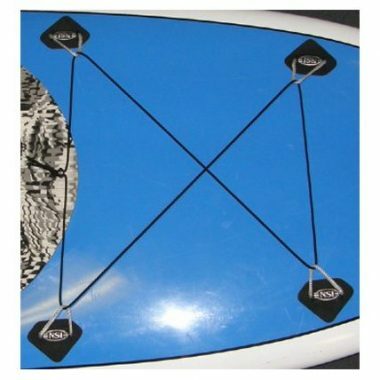 Works great for paddleboarders of all heights and fits all paddleboards. Whether you are 6'5 with a large paddleboard or you are 4'3 with a small surfboard, our strap will work for you! The most basic of the paddle board gear, this strap is sure to make your life much easier. Its adjustable straps extend to fit any size board and any size carrier. The idea is to transfer the weight of your board from your arms as you’d regularly carry it to your shoulder. With a soft and comfortable triple layered shoulder pad you can carry your board with comfort and ease. 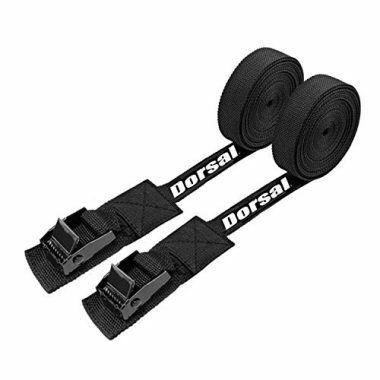 This strap carrier is incredibly durable which means it can fully support the weight of your board for years to come. 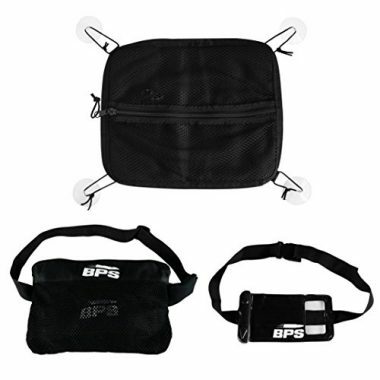 When not in use this strap rolls up small and lightweight making it incredibly easy to store. This case is at the top of our must have stand up paddle board equipment list. It is 100% dust proof, sand proof and waterproof. Fitting any size phone, this case can hold much more than just your phone. Pack some change for a cold drink and your car keys and you’re set for an awesome day on the water. 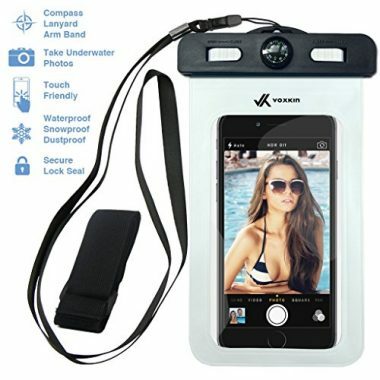 Coming with a lanyard and armband there are different ways you can wear this case. This carrying case even comes with a built-in compass to help guide your way for overnight adventures with your SUP. Our favorite part is that it has a touch sensitive design which allows you to send texts and even take photos through the transparent case. Talk about a great accessory. As far as paddle boarding accessories go you can never have too many dry bags. 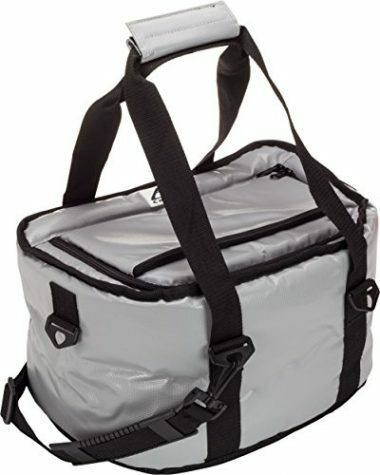 This top of the line bag comes in different sizes ranging from 5 to 40 liters. A touch sensitive design gives you complete access to any of your touch screen devices. Simply strap this dry bag to your sup and feel confident that your gear will stay safe and dry no matter where you go. With shoulder straps attached, it’s easier than ever to transport all your luggage for your next adventure. This is great for those with dogs, kids or who are generally heavy packers. Your day on the lake isn’t truly complete without the SUP Buddy. Among the best sup boardaccessories for any party, this allows you to bring your drinks with you wherever you go. Really, what more could you ask for? A cold drink will never be more than arms reach away. Available in six colors, this bottle koozie with a velcro bottom that sticks to a suction cupped velcro circle that can hold up to three beer koozies. Have one of these and you will quickly become the life of the party. Gone are the days that paddle boarding is restricted to sunlight hours. With this sup lamp you can take in a breathtaking sunset while on the water, go for a moonlight paddle, or extend your time on the water for longer overnight trips. Experience 200 hours of bright LED lighting on your trip, all powered by only two AA batteries. 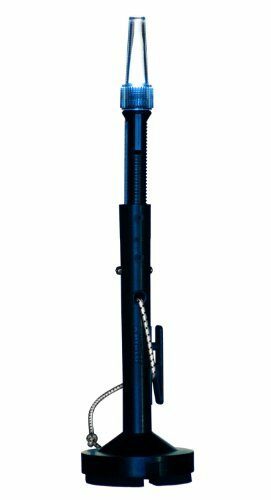 With marine grade materials this light is sure to perform, even being submersible to 1000 feet. The Kayalu Kayalite light is Incredibly durable. This is not only a beneficial accessory, it can add a lot of safety to extended trips. 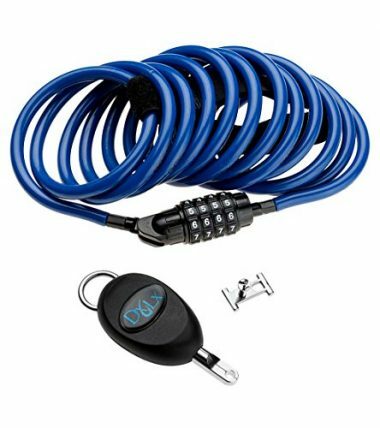 This SUP board lock is easy to use and will ensure that your SUP is taken care of. Simply attach it to your recessed leash plug. Don’t have one? No problem, it even comes equipped with an attachment you can clip to your fin. The 10’ coiled steel wire cable will ensure that your board is safe on the roof of your car, attached to a park bench or wherever else you go. The high-quality stainless steel lock will not rust or corrode in salt water ensuring it can be used anywhere you take it. No key to hold onto with this board lock, simply add your four digit pin and trust that your board is secured. This wheeled carrier is great for transporting any size board for long distance ventures, or if your hands are filled with other accessories. This is a lightweight system that has detachable wheels that make it easy to store when not in use. The aluminum bars and hardware are guaranteed to not rust which makes it great to bring to the ocean. This is reinforced by a 100% money back guarantee. The large wheels make it easy to navigate through sand and rough terrain. As a bonus, it comes with a lifetime – this deal just keeps getting sweeter. Need more storage? 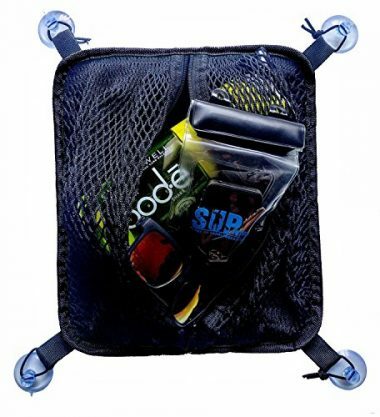 This deck bag easily mounts to any SUP using four industrial grade suction cups. A mesh bag is stretched in between them to create a great home for everything you need for a day on the water. Large enough to fit the important things like sandals and sunscreen but compact enough to not get in the way this system is the perfect size for any board. It also comes with a waterproof insert so you can be sure that your keys and phone will be safe as you paddle. This is a lightweight over the shoulder strap system that makes it so you can transport your rigid SUP easily. The most basic of the paddle board gear, this strap is sure to make your life much easier. Its adjustable straps extend to fit any size board and any size carrier. The idea is to transfer the weight of your board from your arms as you’d regularly carry it to your shoulder. With a soft and comfortable triple layered shoulder pad you can carry your board with comfort and ease. This strap carrier is incredibly durable which means it can fully support the weight of your board for years to come. When not in use this strap rolls up small and lightweight making it incredibly easy to store. Bring your pool parties to the lake this summer with your paddle board. Skip the busy beach packed with kids and head to the middle of the lake with your specialized SUP anchor. This kit allows you to anchor in 15 ft deep water ensuring you bring the party with you or simply enjoy your time tanning with a group of friends. 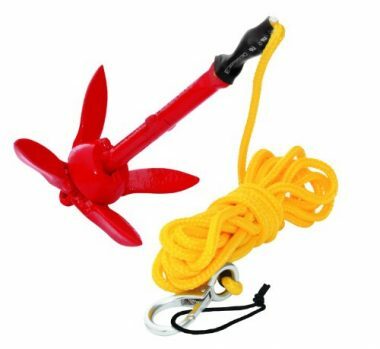 This anchor is super compact folding down to a small size making it easily transportable. It will even fit in your sup bag. This anchor will not rust even in salt water because it uses a stainless steel system. Only weighing 1.5 lbs, this anchor is a great lightweight addition to your paddle boarding setup. Paddle boarding is no longer just a summer activity when you are equipped with the proper gear, including the best neoprene socks. Never fear the cold water again with these thick and incredibly warm socks that can be used for both men and women. 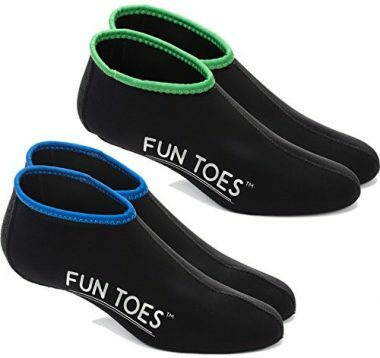 These are the perfect addition to a wet suit, or simply wear them and watch as your season gets longer. These socks provide added grip to your board and can even be used as water shoes well for painful rocks. As an even better bonus, you get an extra pair of these water socks when you order them. If you’re anything like us, your pup is more than just a dog, he’s your furry kid. You want to bring him everywhere with you and now you can. Test your pup’s balance by bringing him on your paddle board. 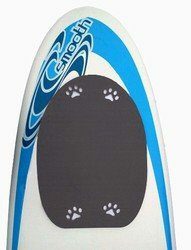 This traction pad is a great sup accessory to ensure your dog can stay securely on the board with you. It also adds a welcomed barrier against your dog’s nails and your precious board. Its oval design is sure to fit on most paddle boards. The 3M adhesive will create a firm bond to your board. This will also give your dog a specific area that is his which will make him feel more secure. You spent hundreds, maybe even thousands on your sup including roof rack for your car. But where are you going to store your board when the weather turns cold? You need a storage solution that will hold your board against the wall, freeing up some valuable space in your garage or storage room. The SUP Rack will do just that. It is has a rust resistant finish on this wall mount will help ensure it lasts many years to come. 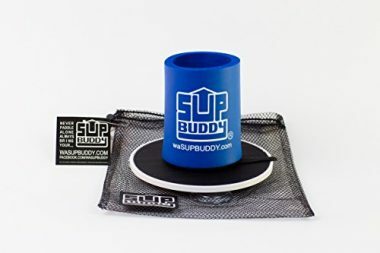 This sup holder is great for the whole family holding three boards at a maximum weight of 75 lbs. Adding a cooler onto your board will allow you to bring your drinks with you anywhere you go. The AO Cooler will ensure your drinks and snacks stay cold no matter how long you ride for. 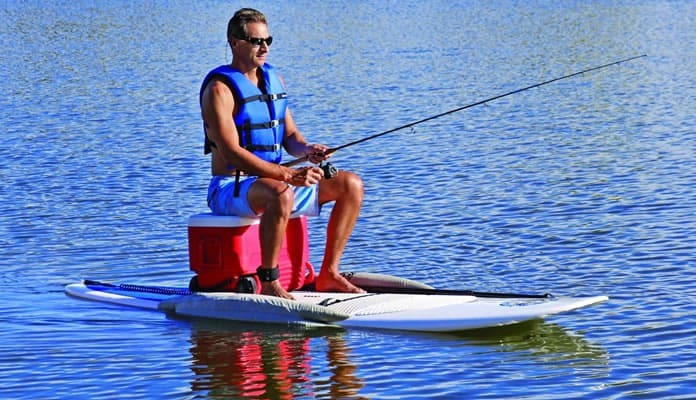 This cooler is great for those who fish on their SUP. Load some ice into the cooler and you have a place to put your fresh catch. Being lightweight with a flexible design making it easy to transport. Being completely waterproof ensures this cooler will hold ice for 24 hours. A leak proof design makes it safe to bring in your car without worry. 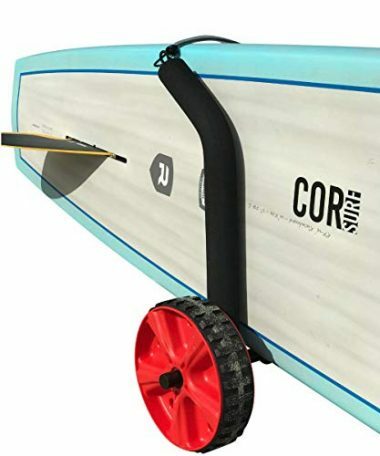 This cooler is easily secured to your paddle board with use of the provided suction cups, or it can be tied down using the eye hooks provided. This is a summer must have, especially when fishing. It’s true what they say, you can never have too much storage. This goes for your paddle board as well. Whether you are a weekend warrior or an avid paddler, having added places to hold your gear will prove infinitely valuable. With this bungee system, you can increase your storage space and pack even more gear with you on your next adventure. An impressive bungee system gives you more space to pack your gear onto your board for your next overnight or long distance paddle. Great for storing a ton of gear without weighing your board down with added storage solutions. This is a zippered mesh bag that sits securely on your paddleboard. It is a great SUP accessory that will fit onto any board. This bag is a great place to stash your water bottle, some snacks and some valuable sunscreen for a mid lake reboot. 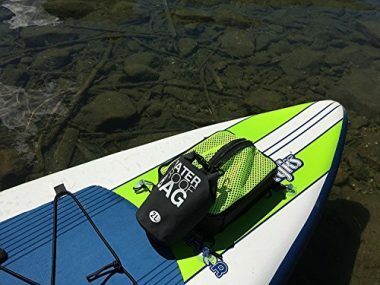 Extend your time spent on the water with this SUP bag. Weighing in at less than half a pound it is ultra portable. As a bonus, this useful accessory comes with a 100% lifetime warranty so you can be sure you made a good buy. Need a quick and easy way to transport your boards? These tie down straps are just what you’re looking for. Coming in at 15 feet long, these straps allow you to throw your boards on the roof of any vehicle and safely secure them down without using any hardware. Preserve the look of your vehicle by not having to drill into your roof. 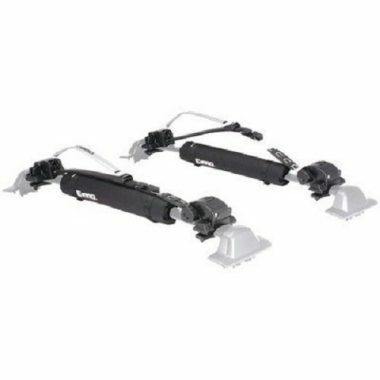 These tie down straps are also a great option for those with multiple vehicles, allowing you to carry your board on different vehicles using only one roof rack system. 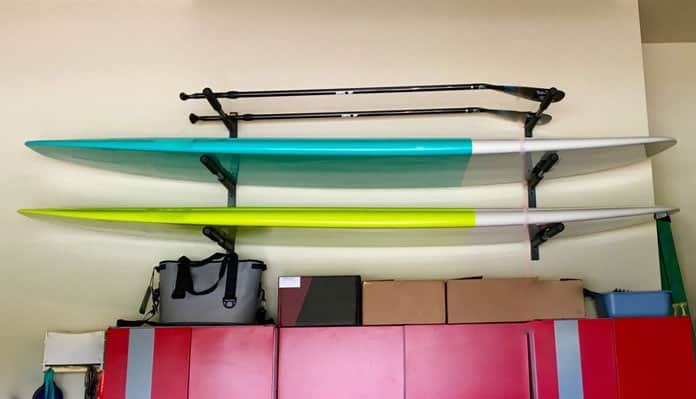 This cross bar is a great way to transport your SUP on your car’s roof racks. Easy to install and incredibly durable, these cross bars will mount to both square and rounded roof racks which ensure they fit on any car, SUV, or truck. A ratcheting system allows them to be effortlessly secured to your roof. Locks on the hinges add security to the system giving you peace of mind while you run into the store. 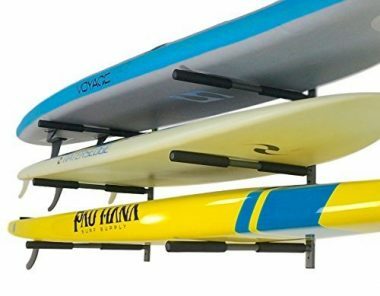 This cross bar will create ease and simplicity while transporting a wide range of paddle boards on your car’s roof. Never struggle with balancing your paddle board and paddle again with this handy paddle hugger. Simply install this Storage Sling to your board using a highly adhesive Storage Sling and allow your paddle to stick to your board with ease. Made using high-density foam, this paddle carrying system is incredibly durable. Use this system when carrying your board to minimize the amount you have to carry, giving you a hands-free SUP experience. 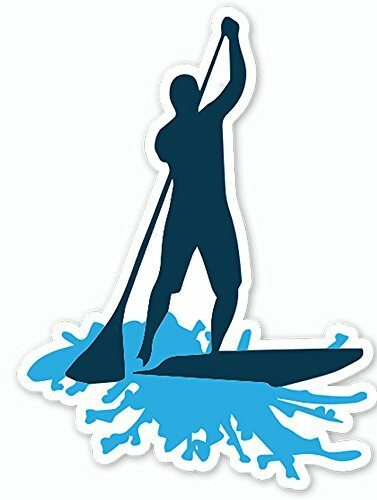 Show your love for this fast growing sport with this SUP sticker. Sport it on your car, paddle board or even your computer and show the world how much you love taking your sup on adventures. It has an extra durable design with a UV layer makes it so this fun sticker will stay on in rain or shine. Feel good about this purchase knowing 10% of profits goes directly to ocean clean up. If you can think it up someone has made it. This increasingly popular adventure sport is only growing with popularity. This means that all the best sup board accessories you can think of are available. The best sup accessories will come fully equipped with waterproof and lightweight technology which makes it specialized to the sport. Love bringing your pup on your board? There is a traction pad accessory to keep your dog comfortable. Expand your paddle time with glowing lights on your board, perfect for sunset paddles. Attach an anchor for mid-lake tanning, even pop a cooler on top for the ultimate party setting. Whatever you decide you are guaranteed to make your day on the lake that much more enjoyable. SUP accessories will come fully equipped with waterproof and lightweight technology which makes it specialized to the sport. Love bringing your pup on your board? There is a traction pad accessory to keep your dog comfortable. Expand your paddle time with glowing lights on your board, perfect for sunset paddles. Attach an anchor for mid-lake tanning, even pop a cooler on top for the ultimate party setting. Whatever you decide you are guaranteed to make your day on the lake that much more enjoyable. When you think about how to best choose your accessories, you need to first think about which accessories you need. When paddleboarding first became a part of the watersports world, there were only boards and paddles. As time has progressed, the number of accessories has increased. The question is, do we need all of these accessories? Or have we been inundated with stuff which we do not need? Yes, there are a lot of accessories on the market which we do not need, but there are also a lot which are quite useful. They can be broken down into two categories: safety and luxury. With safety accessories, such as life vests, you need to consider where you are paddling. We always recommend wearing a life vest at all times, and there are other safety accessories which can save your life, but you should always think about the equipment which you need. The same is true for the luxury items. There are many which we do not need, but there are some which can improve our paddling experiences, such as storage bags. You need to ask yourself which accessories you need and which you want, then go from there. The cost of an accessory is a big deal, especially when it is something you only need and not necessarily want. The first thing you need to ask yourself is: do I really need this? If the answer is yes, then you can begin to shop around for the best deals. We all want something cheap, but we would always recommend purchasing accessories which are high-quality, and not necessarily the cheapest. Products which last will save you the most money in the long run. 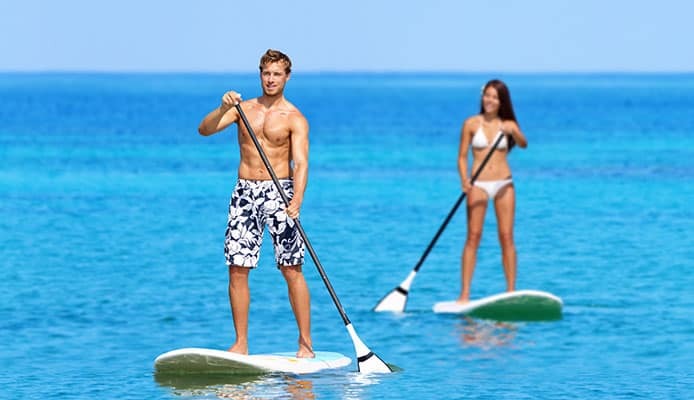 If you have ever been paddle boarding, then you know that the space on the board is limited. You may want to load up your board with a lot of accessories, but there is simply not enough space to accommodate all of the accessories which you want. The key is to choose the accessories which are most needed and make sure that you have space for all of them. If you do not, then you will have to leave some of them behind. When you are choosing your accessories, you should be looking for small products. It may be more beneficial to spend a little more money to get an item which is smaller and more compact. You should also have one eye on the weight of your products. You may think that you have done well in securing multiple small products, but if your paddleboard cannot hold the weight of you and your cargo, then you are not going to be able to take everything with you. We recommend a board which can carry at least 20% more than the total weight to be carried. We have already talked about the lack of space on a board and the weight limits, and with that in mind, we have suggested buying smaller products, but there is another way in which you can do. Instead of buying multiple small products, try to find products which are multifunctional. You may find a life vest which has storage space on it or a cooler which doubles as a seat. Look for products which have a function, but also come with storage space, and you will be on your way to an organized paddleboard with lots of accessories. Just be sure that you are not buying multifunctional products for the sake of it. It goes without saying that an accessory should be able to use, but you would be surprised how many people get caught up in the price, size, and functionality. If you are out on the water, and you are trying to use an accessory without being able to, then you are going to find yourself very frustrated without being able to do anything about it. Check the product description, but also check the product reviews to see if anyone has had any problems using the product. Q: Why Do I Need Accessories For My Paddle Board? A: There are two main reasons to buy paddleboard accessories: safety and enjoyment. There are many accessories out there, and many are needed by all paddleboarders, and many are only wanted (of course, there are some which no one should need or want). 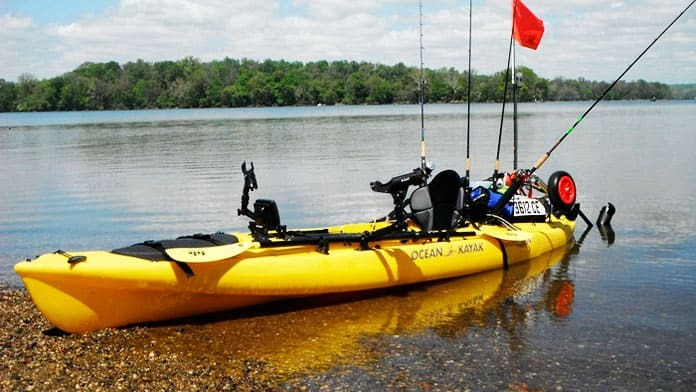 When you are out on the water, there are many dangers lurking, and even the most experienced kayaker can find themselves in the water if they are not careful. When you are in the water, you are going to be glad of protection and flotation. You are also going to run into wagers such as weather and other paddleboarders. Accessories can help you to be visible in the water, and protected from the elements. You also want to have fun out in the water. Some accessories are a luxury, but they are a welcome luxury. Of course, there are products which you do not need, but what would life be without a little luxury. Having extra storage on your craft can allow you to bring some extra food. A cooler can even keep that food cool. A waterproof case will protect your belongings, and a carrier will help you to transport your paddleboard. There are many reasons to buy accessories for your paddleboards, and if you can afford it, then there are no wrong reasons to buy one. Q: What Are The Top 3 Must-Have Accessories? A: We have already talked about how essential it is to have a life vest on at all times on the water, so we are not going to make that one of our top three. When we thought about it, we realized that a lot of the essentials are already going to be on your mind, so we have gone for three accessories which will give you some protection, but will mainly improve the quality of your trip. 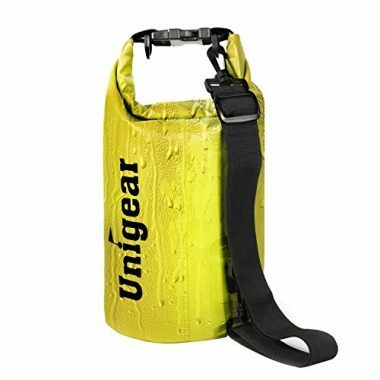 The first is a dry gear bag. If you have somewhere to keep your possessions dry, then you are going to be able to go out on the water longer. A good bag should seal well, be durable, and be waterproof. A cooler is our next essential. Paddleboarding is so relaxing and meditative but can be made all the better with a little food and refreshments. There is nothing better than a cold drink and a bite to eat. When you do have that chilled drink, you are going to want a cup holder to hold it when you paddle, so our third essential is a cup holder which can be attached to your board. Your board is not complete without accessories. The items on this list will make your day, or weekend, on the water that much more enjoyable. Having the right paddle boarding accessories will transform this from a sport to a way of life. Grow as this activity does by incorporating this full body workout into every part of your life. 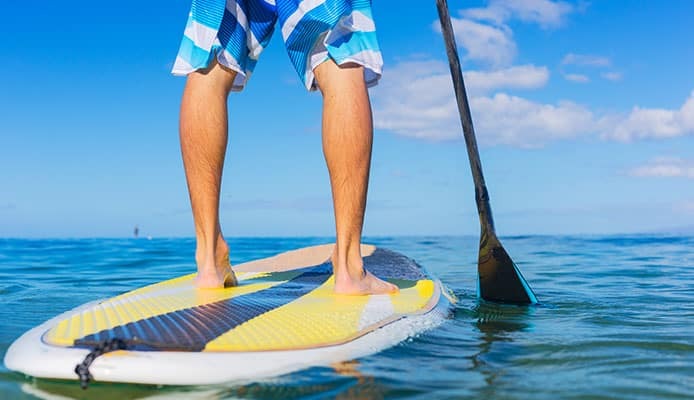 You will sure to be the envy of the summer by dressing your paddle board up with the latest gear is sure to give you endless fun in the sun. Have any of the accessories on our list? Or, did we miss your favorite? Chat with us about it in the comment section below.